So I ordered the new Monroe Bag and it arrived today. Have to say that so far it is EXACTLY what I wanted. 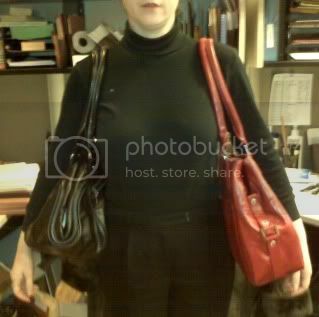 I have been carrying the Zuma, which is also a Namaste bag. However, the Zuma is a big pocket in the middle where everything sinks to the bottom. 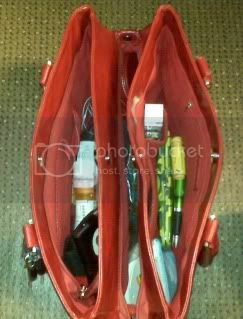 Plus the sides are a little more open than I like and it tends to be a floppy bag. I have always been scared I'd lose something out of it. But as a bag, I liked it. 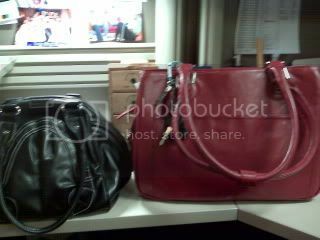 The other issue was that I had to have my project in a bag inside my Zuma or it got all tangled up with my purse crap. The Monroe is a more structured bag. Very professional. A little bigger than the Zuma, but that is great because I can fit all my purse crap, plus my knitting, plus my iPod, Kindle and lunch in it and it will still close all the way. The color is a true lipstick red (blue based red, not orange based) and is beautiful. This is the Monroe (red) behind the Zuma (black). It is a little bigger, but more structured. This is the Monroe next to the Zuma again for comparison. This is the Monroe with a letter size legal pad against it. 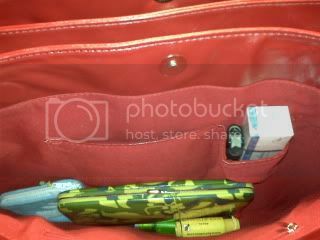 The purse stuff pocket. 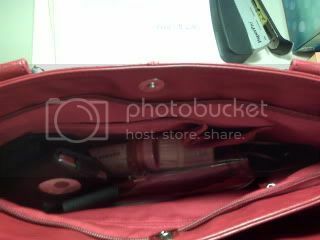 This is where my random crap is like hand sanitizer, medicine, epipen, lipstick, iPod, hair tie, etc. The small zipper pocket on the side holds my bluetooth device and my iPod ear phones. There is also a document pocket on the back that will be handy for stuff. 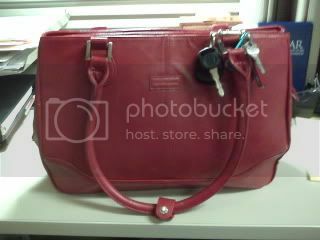 Now I can carry my stuff to work all in one bag instead of a purse and a plastic bag of bills to pay and my lunch. As you can see, I have plenty of room left in this bag for more stuff!! 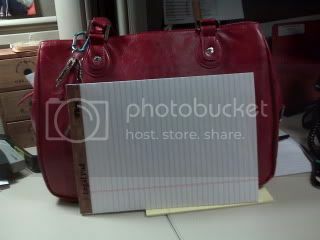 The front of the bag is very nice without the document pocket. And the little tab you see - that snaps around both straps to keep them on your shoulder better. Only thing I don't like is that it is not attached in any way to the straps, so it will be easy to lose if I am not careful. 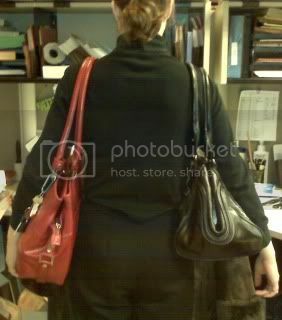 I hope that all the photos will help you make a decision if you were on the fence about the bags! 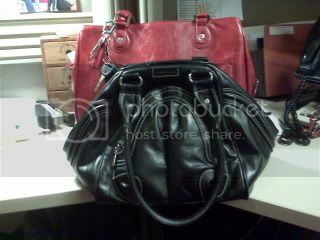 Great photos, and I'm so glad you love the bag. I totally agree. I've been carrying mine around for two weeks and I'm completely sold on it! Great review, and we're so glad you're enjoying your Monroe bag! This was very helpful - thanks. I was thinking I wanted a black one but now I'm kind of loving the red! Off to see where I can get it! WOW what a great write-up. I am definitely sold and now cannot wait for mine to get here. I was toying between the red and eggplant and WAAAA your post didn't help LOL. I was really confused about buying the Monroe, but after seeing your helpful pics and review I'm more confident about buying it now. Thanks so much for your help! Yep, the Monroe is on my Must Have list. 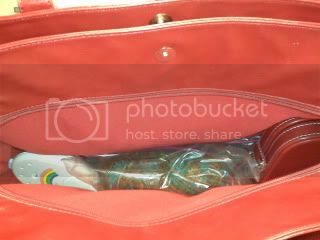 I have the Zuma aka The Grouper Bag as well, but due to my height, its quite uncomfortable to carry over the shoulder (i.e. too big for an "armpit" bag, LOL). The wallet that recently came out looks great, too! Great Review! How heavy is the bag before being loaded? Looks awesome! I'm a Namaste Laguna fan myself but I may just have to get a Monroe now! Great pictures - that is so helpful!!! I had a zuma I ended up selling on Rav - I loved the look but it was too floppy for me, I like more structure as you do. Awesome review - now i want one! 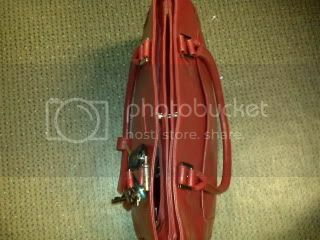 Thank you for the detailed review and photos. One thing though and it's unrelated to the bag or knitting, give up the smokes. Thank you SO much for doing this post! I'm trying to decide which Namaste bag to purchase, and your post helped me decide on the Monroe. Thanks again! I know this post is going on 2 years old, but I have been trying to decide between Monroe and Zuma for two days and your post was written as if you could read my mind and answer all of my questions! I'm going to order the Monroe in red and I can't wait!